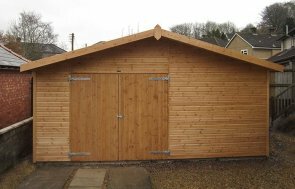 This Timber Garage is 3.6 x 6.0m in size, and it has been installed in our customer’s garden in Edwalton, Nottinghamshire to be used as a large workshop. There are large double doors in the front gable of the garage, and another single door towards the back on the right-hand side. To allow plenty of natural light into the garage, there are four windows on the right-hand side, one of which opens, and another set of four windows on the rear gable (one of these can be opened as well). There is a thick, heavy duty felt on the roof, weatherboard cladding on the externals, and the whole garage has been finished in Black Sikkens Paint. There is also a workbench inside that stretches out across the back gable. With our versatility in design, size and finish, we can provide you with a garage that meets all your requirements. The robust construction will give you a long-term building for us as a workshop with a sturdy concrete floor, a place to store your vehicle or for multiple uses with the help of a partition. If you would like a garage, you can use our Online Garden Building Planner Tool to design a building of your dreams. For more information on our timber garages or to view the full range, click on the link below.